We know what it takes to grow the perfect grape. Growing quality, harvest ready fruit is a long, complex process. At Bayer we understand every stage and work closely with you to provide an integrated crop solution with a suite of products across all key parts of the growing season. Not just any products - products with a heritage of research and development supported by comprehensive in-the-field technical support but most importantly, products that are proven to work season after season, by you, the grower. For more information about our product range or for fact sheets, growing guides and tools you need to grow the perfect crop visit cropscience.bayer.co.nz. Movento®, Buster®, Serenade Max®, Luna Sensation® and Teldor® are registered pursuants to the ACVM Act 1997, No. P8434, P3604, P5809, P9161 and P7020 are approved pursuants to the HNSO Act 1996, HSR100545, HSR000152, HSR000656, No HSR100998 and HSR00008. Movento®, Buster®, Serenade Max®, Luna Sensation® and Teldor® are registered trademarks of the Bayer Group. ©Bayer 2017. Marlborough’s wine industry contributes $477 million to the region’s economy and has grown by 300% since 2000, according to a new economic impact report. A challenge that faces viticulturists each season is estimating vineyard yields at a suitable time to enable appropriate management decisions to be undertaken. Dr. Mike Trought offers some advice. 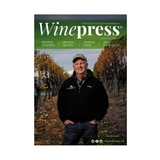 Disclaimer: The views and articles that are expressed and appear in Winepress are entirely those of contributors and in no way reflect the policy of the Marlborough Winegrowers. Any advice given, implied or suggested should be considered on its merits, and no responsibility can be taken for problems arising from the use of such information. possible ceilings we should also consider the “centre of gravity” of our wine scores and ratings. You only have to look at the share number of 90+ scores, five star ratings, trophies and gold medals that our Sauvignon Blancs receive annually across the world. Our Sauvignon Blanc turns heads and gets attention - we know that. This means the “centre of gravity” of wine scores is healthy and often easily applied to promotional opportunities. There are many varieties, style and regions where the ceiling is far lower than Exceptional at Decanter Wine Magazine. This is something to be extremely proud of and worth protecting - but that is another highly topical issue. So in order to keep pushing back the ceiling - or smashing through it we need to be collective and focused, and use our time with consumers, trade, media and influencers to push our message of quality, integrity and complexity as a variety, a style and a region. With the healthiest scionwood and rootstock material harvested from our source block, we are now grafting for next yearsâ&#x20AC;&#x2122; plantings. GET IN TOUCH NOW TO SECURE YOUR NZWGGS CERTIFIED VINES FOR 2018.
the total number of frosts can vary markedly from year to year. The yellow line indicates that the 10-year moving mean has largely been decreasing, notwithstanding that there was a slight increase from 2004 to 2010. The red trend line starts out at 61.9 winter ground frosts in 1932, however by 2017 this has dropped to 31.9; i.e. In 2017 Blenheim is only recording approximately half as many winter frosts as it did in 1932. Soil Temperatures Soil temperatures were well above average for August as a consequence of the warm air temperature. 10 cm mean soil temperature = 8.8°C; 2.3°C above average 20 cm mean soil temperature = 9.5°C; 1.9°C above average 30 cm mean soil temperature = 9.8°C; 1.3°C above average 100 cm mean soil temperature = 10.6°C; 0.6°C above average The shallower 10 cm soil responds rapidly to changes in daily air temperature. After two heavy ground frosts on 3 and 4 August, of -5.0 and -4.6°C, the 10 cm soil temperature was 5.7°C on 4 August. It rose to 10.2°C on 17 August after a couple of warm days but was only 7.2°C on 23 August after a few days of frost. In the week from 23 to 30 August the 10 cm soil temperature rose from 7.2 to 11.8°C. In contrast the deep soil at 100 cm only gradually warms up coming into spring and the few days of cold frost in August had little perceptible effect on the temperature at this depth. The 100 cm soil temperature rose from 10.4°C on 1 August to 11.1°C on 31 August. of Sauvignon blanc in central Rapaura normally occurs in the first week of October, the September temperatures will have a big influence on the date of budburst. evapotranspiration lost. The moisture deficit in Marlborough going into the start of the 2016/17 season is much less (a higher positive number) than in either 2015 or 2016. Rainfall from January to August 2017 is 170 mm higher than for January to August 2015, and 72 mm higher than for January to August 2016. High rainfall in April 2017 is largely responsible for the lower moisture deficit to the end of August 2017.
intellectual property of a wine region by allowing for registration of the region’s name as a GI. That ensures the name is reserved only for wine from that region, and will give the region’s winegrowers a greater ability to protect those GI names from misuse overseas. Jeffrey says the registration of the 18 registered GIs will provide “a solid platform” for New Zealand wine producers to promote wines and regions in international markets “and ensure investment in our regional identities are better protected”. HML Silco delivers HML32 right to the target area - forming a liquid bridge between berries and between grape and leaf, where disease infection often begins and holds it there. the Sustainable Winegrowers New Zealand (SWNZ) programme. Sandra Taylor, who is the Chief Executive of consulting firm Sustainable Business International and author of The Business of Sustainable Wine, emphasised that consumers do care about sustainability. Her statistics – 72% of millennials are willing to pay more for sustainable products, 50% of global consumers say they consider green factors when making decisions, and 56% of consumers are willing to pay more for sustainable brands – showed that the investment in sustainability could pay off in the market place. “You have as growers figured out the benefits and attractiveness of sustainability,” she said “Obviously because this industry is nearly 100% certified sustainable.” However, the next step was in letting consumers know. “I think they want it. They want to know and I think that’s the challenge.” Her book is about how sustainability can be integrated into brands and marketing. “I think the challenge of the industry is how we communicate that (sustainability) to consumers.” Rabo Bank research analyst Blake Holgate told delegates that sustainability has moved away from being a niche product to being a core function of the food service industry. Last year an annual American study of chefs found that environmental sustainability was number six on the list of “key hot trends”, but 42% predicted that within 10 years, it would be at number one. Two Grape minds think alike. Only Pristine® combines two active ingredients to deliver twice the power and performance of ordinary fungicides. For ultimate control of botrytis, powdery mildew and downy mildew, think Pristine®, the only fungicide that combines two exclusive BASF active ingredients of boscalid and F500®. With these two potent modes of action working together, Pristine® provides a built-in resistance strategy and twice the power and performance to increase crop yield and quality. a company’s financials within the wider industry numbers means looking at those “to the left and the right” of your own position, he says. “Looking at the band you are in but also looking at the band above and maybe the band below and thinking ‘where’s the sweet spot?’ You may not want to go up, you may want to go down, because there might be more profit at a smaller level.” He also hopes this year’s survey will receive many more responses, “to drive more useful data outputs”. and identify numerous plant viruses, including two that are new to science. The final speaker was Emma Sherman of the University of Auckland, whose research questions whether wine composition can predict quality. Emma used an expert panel of wine professionals to assess the wines, and an untargeted Ultra Performance Liquid Chromatography (UPLC) and Q-Exactive Orbitrap mass spectrometry system to obtain the non-volatile and volatile profiles of each wine. Emma analysed the chemical profiles and the perceived ratings, and found that non-volatile wine profiles were more strongly correlated with wine quality than volatile. Mike says the metabolomics approach to wine quality is another example of a researcher looking through an “unconstrained” lens to explore facets of wine. scheme, and a series of their national flags were carried around the vineyard, reflecting the countries represented in the field. The prize giving at Giesen Sports Centre in Renwick was a full house and a “really special evening”, that recognised the value of the pruners to the region, says Jeremy. those in the Recognised Seasonal Employer scheme, are not captured by the survey. The wine industry also indirectly supports another 2,500 jobs in other sectors, including significant numbers in meal services, packaging and agriculture support services. John says that is likely to be a conservative number, as it reflects the sectors that feed into the wine industry, but doesn’t take into account the retail and accommodation jobs that are closely linked. Neil Henry, the Marlborough District Council’s strategic planning and economic development manager, says the report confirms the “critical importance” of the wine industry to Marlborough’s economy, in terms of money, jobs, wages and profile. construction and retail sectors have had a good year. Marlborough Mayor John Leggett says the results indicate an expanding local economy, which has had to absorb both positive and negative economic effects from the Kaikoura earthquake. He says tourism spending is up by half a per cent and Marlborough’s valuable international visitor market continues to build, despite the earthquake. Trusted and proven for decades to deliver punishment to weeds. Buster has a reputation like no other for dealing to weeds and being safe to crop plants – why settle for anything less? Insist on Buster from Bayer. www.buster.co.nz Buster® is registered pursuant to the ACVM Act 1997, No. P3604 and is approved pursuant to the HSNO Act 1996, No. 000152. Buster® is a registered trademark of the Bayer Group. © Bayer 2017. Election 2017 In the lead up to New Zealand’s general election on September 23, four Marlborough wine industry members have posed questions for the Kaikoura Electorate candidates. In August, Rhyan Wardman asked about New Zealand’s clean green image while Michael Wentworth asked for perspectives on the industry’s skills shortages. This month it is research and biosecurity. Biosecurity plays an important role in ensuring the long-term sustainability of the wine industry. How would your party ensure New Zealand’s primary industries are protected from strategic biosecurity risks, such as forecasted growth in trade and passenger volumes? (Dr Edwin Massey, New Zealand Winegrowers Biosecurity Manager) Jamie Arbuckle – New Zealand First Frankly, Government and the Ministry for Primary Industries need to up their game with a succession of biosecurity threats happening or looming. Recently myrtle rust, giant aphid have turned up. The tree fungus Rapid Ohia Death that has devastated forests in Hawaii has now been detected in Tahiti, and with slack surveillance and attitudes the potential is for it to reach New Zealand. After fruit fly, myrtle rust, and 101 other things that have arrived in New Zealand, people have every right to be highly concerned about how seriously the government is treating biosecurity. New Zealand simply cannot afford another failure of MPI’s border biosecurity net. It’s vital to our primary sectors. NZ First would increase funding for biosecurity. It’s that important. alcohol and lower calorie ‘lighter’ wines. It is the largest research and development effort ever undertaken by New Zealand’s wine industry. We’ve supported the establishment of four regional research institutes across the country, including the Marlboroughbased New Zealand Research Institute of Viticulture and Oenology, announced last year. The Institute will support innovation in Marlborough and bring jobs to the region. Janette Walker Regional development is a priority for Labour. We will develop a Regional Development Fund, providing financial backing for game-changing projects for regions that will deliver long-term sustainable growth. New Zealand’s investment in R&D as a proportion of GDP is almost half of the OECD average. The Callaghan Innovation model limits the opportunities for small - medium businesses. Labour, recognising the importance of the industry, funded the development of Marlborough’s Wine Research Centre. Labour will restore R&D Tax credits. Marlborough’s wine industry does have a finite period of expansion, requiring industry to look at further product development and adding value through R&D spending. Young Winemakers THREE YOUNG Marlborough winemakers took top positions at the 2017 Tonnellerie de Mercurey New Zealand Young Winemaker of the Year South Island Final last month, with Babich Wine’s Abigail Maxwell (see pg 30) taking out the title. Kelsey Daniels from VinLink Marlborough came in second with Peter Russell from Framingham Wine Company taking third place. Abigail and Kelsey will now compete for the ultimate title at the National Final later this month, putting their skills to the test against the first and second place winners from the North Island Final. The Young Winemaker competition, now in its third year, is tasked with finding the best winemaking talent in New Zealand, while also providing education and support for those in the industry under 30 years of age. spitting their way through the course. The ninth and final challenge was in the public’s hands, with those attending the evening celebrations tasting wines the competitors had made during the day and voting for their favourite. The 2017 New Zealand Tonnellerie de Mercurey Young Winemaker of the Year will receive an educational training grant, full registration to the Romeo Bragato conference 2018, a profile in Cuisine Magazine, a wine allowance, plus a trip to the Tonnellerie de Mercurey Cooperage in Burgundy. The National Final Awards Dinner and Celebration will be held in Auckland on Wednesday 20th September at Ostro Restaurant, in partnership with Cuisine magazine. Tickets, which are limited, can be purchased directly from Ostro by phoning 09 302 9888.
irrigation and general viticultural knowledge under the spotlight. They also had an interview, competed in the Biostart Hortisports and finally had to deliver a speech at the Bragato conference. Tim gains the title of Bayer Young Viticulturist of the Year 2017, as well as a prize package of a Hyundai Santa Fe for a year, a $5000 AGMARDT travel scholarship, engraved Bahco golden secateurs, $2000 cash, wine glasses and a leadership week. He will also go on to represent the wine industry in the Young Horticulturist of the Year Competition in November. The days of being held to ransom by the destructive ways of mealybugs are gone. Movento’s 2-way systemic control spreads throughout the entire plant hunting down pests in the most difficult to reach places ensuring your grape crops are free from this devastating pest. Insist on Movento from Bayer. Movento 100SC® is registered pursuant to the ACVM Act 1997, No P8434 and to the HSNO Act 1996, No HSR100545. Movento® is a registered trademark of the Bayer Group. ©Bayer 2017.
which was planted in 1996 and 2003, with Pinot Noir, Sauvignon Blanc and Chardonnay covering 6ha in total. The vineyard perfectly aligned to the young viticulturist’s dream, with close plantings organically managed on a lovely site, stretching from stony lowlands to clay slopes, with a small sliver of vineyard at the edge of a stream. It was also the perfect size, Takaki says. “At the moment I have one person helping me, but in the first year I was doing everything myself. It was a little bit big for one person, but was achievable.” He named his brand Folium, Latin for leaf, reflecting the influence of the vines on its wines. While most alternative styles of Sauvignon are crafted in the winery, with barrels, natural ferment and skin contact, the winemaking process for Folium is much the same as the classic Marlborough examples, he says. “But I think we can do something in the vineyard.” For Takaki, that is a better way of creating difference, because the result does nothing to muffle the voice of the land and the vines. That’s why he has chosen organic management and dry farming, having turned off the tap when he took over the land in 2011. Considering Replanting? HI-STEMTM tall vines are an attractive, affordable alternative when considering either replanting or extending your existing vineyard. Over 60,000 cubic metres of storage spread over two sites. Chilled storage available during vintage for handpicked grapes. Sophisticated monitoring equipment ensures your product is kept at the optimum temperature. We could lease you a small room for your exclusive use to suit your particular temperature requirements (0 o C to + 30 o C). awaiting the opportune time to plant. Individual rooms available to grow new budwood. Our own Replanting Programme is open to view at the Wickham Estate on Mills and Ford Rd. That is the question. But you don’t need to be Shakespeare to know that if you want cleaner rows for longer under vines, Alion definitely is the answer. Alion provides long lasting (up to 5 months) pre-emergent control of broadleaf and grass weeds in your vineyard. Alion manages the weeds and allows you to concentrate on other important jobs in the vineyard. Insist on Alion from Bayer. Alion® is registered pursuant to the ACVM Act 1997, No. P9421 and is approved pursuant to the HSNO Act 1996, No. HSR 101193 Alion® is a registered trademark of the Bayer Group. © Bayer 2017. Biosecurity and Emergency Response Manager, Edwin.massey@nzwine.com 0211924924. If you see anything unusual donâ&#x20AC;&#x2122;t forget to Catch it: Snap it: Report it. Call the MPI biosecurity hotline 0800 80 99 66. Spy Valley’s new finance manager Dean McLoughlin is happy to be back in his vineyard, back in Marlborough, and back in an industry he loves. Dean had his first taste of the wine industry pruning grapes in his home town of Gisborne as a teenager, and planted a small vineyard on Guernsey Road when he and his family moved to Marlborough in 1998. Dean commuted to Wellington to work in banking and government, then moved to Nelson for a short stint before returning for his new role. Real Estate Update July and August were quiet months for viticultural sales, says Joe Blakiston of PGG Wrightson Real Estate. Joe says the only significant sale reported was an established 30-hectare production block on Swamp Rd, which was sold to a local wine company. The sale equates to close to $270,000 per hectare and shows “keen interest” in good producing blocks, with the vineyard a typically higher yielding property. Wine tourism focus Nearly a quarter of New Zealand’s international visitors are visiting wineries, vineyards and cellar doors, according to new research from Tourism New Zealand. New Zealand Winegrowers (NZW) is responding to the demand with a wine tourism section on its nzwine.com site, where more than 450 wine experiences are showcased. The new ‘visit’ section of the site allows tourists to search wine regions using a Google map tool, or to filter listings by region and experience types, with Sip (230 cellar doors), Dine (110 winery dining options), Stay (60 vineyard accommodation outlets) and Play (50 onsite tours or experiences) on offer. NZW Global Marketing Director Chris Yorke says wine tourism provides an exciting new opportunity to highlight New Zealand wines in their unique locations. “Our visitors are also able to meet the people and hear the stories behind the brands.” NZW is also partnering with Tourism New Zealand to develop online tourism training modules for wineries and Tourism New Zealand CEO, Stephen England-Hall, was a keynote speaker at the Romeo Bragato Conference last month. “Wine tourism has such wide appeal because visitors to New Zealand can explore wineries in any season, and across many regions during their stay,” he says. “Our research has found that wine visitors spend more, stay longer, and visit more regions than the average international holidaymaker.” Stephen says nzwine.com/visit will enhance the experience that tourists have by providing useful information before and during their trip. “This allows visitors to make the most of their stay, and go home with great stories and memories.” will become true ambassadors for New Zealand wine. At the end of their experience we hope the scholars will share personal wine discoveries and insights from their trips with their customers and the wider sommelier community – something we simply can’t replicate in a classroom.” Successful applicants will engage with and learn from some of the greatest minds in the business while sampling benchmark wines from New Zealand on a unique experience at one of the sought after New Zealand Wine Sommits, to be held in Nelson and Central Otago. Hosted by Master Sommelier Cameron Douglas and Master of Wine Stephen Wong, the events are a celebration of the lesser known aspects of New Zealand wine, with particular emphasis on the facets that resonate with the sommelier community, says Chris. Candidates are expected to have a strong passion for the wine industry, and be able to demonstrate a thirst for knowledge of New Zealand wine. A selection committee will review all applications with a shortlist of candidates invited to take part in a panel interview. Visit https://www.nzwine.com/ en/events/new-zealand-winesommit/ for more information and to apply. Advocacy Manager Vance Kerslake has joined the Wine Marlborough team as Advocacy Manager and is looking forward to tackling advocacy issues in areas members frequently face, including water, interaction with local and central government, labour, and community relationships. Wine Happenings A monthly list of events within the New Zealand wine industry. GREAT FOOD, GREAT WINES AND GREAT FRIENDS COME TOGETHER AT HERZOG’S BISTRO! Unpretentious and inviting, Herzog’s Bistro offers fantastic market-fresh dishes at modest prices. Relax in the beautiful gardens by day or cosy up in front of the fire by night. And for all you wine aficionados, come and indulge in one of New Zealand’s largest International wine lists! Ask about wire, posts, bamboo canes and sleeves for all your vineyard development. Talk to our Technical Advisors about herbicide options to suit your needs in the vineyard. Take the guess work out of disease management and discuss all your fungicide requirements with our Technical Advisors. Ideal time to ask us about planning your fertigation and foliar nutrient requirements for the upcoming growing season. For all the winter solutions you need, talk to the Farmlands Horticulture team today. 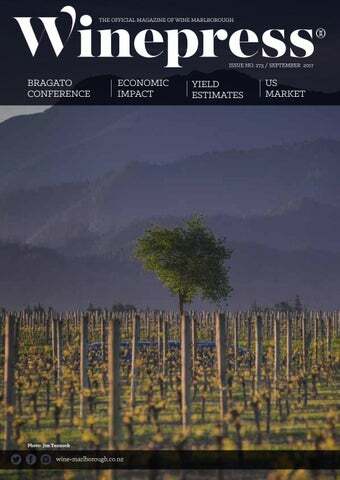 September Winepress includes coverage of the Romeo Bragato Conference, Yield Estimates, the US Market, Economic Impact plus more.